I love doing science experiments with my kiddos and am always looking for a good excuse to blow something up. So when I came up with this Young Women Activity, I couldn’t help but be a little excited! This would also make a great Family Home Evening lesson. For the activity we drew parallels between fun science experiments and how we should conduct our own spiritual experiments. 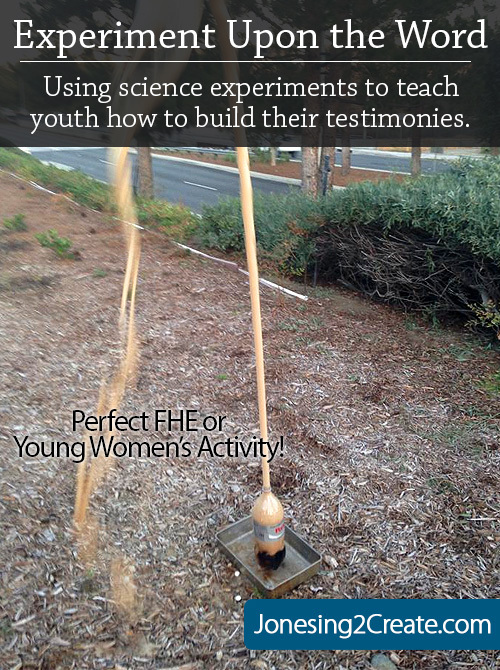 To teach the girls how to “experiment upon the word” and use what they have learned to grow their own testimonies. To teach the girls how to come up with gospel parallels or spiritual lessons in their lives. Introduction: To start things off we talked about what the word “experiment” meant. We also discussed why some kind of action was required in order to experiment. You can’t conduct an experiment without getting up and doing something. It is not a passive activity. Scientific Method: I gave an overview of the Scientific Method and told the girls that it was a way to answer scientific questions using experiments and observations. Applying it to Scripture: We then tried to identify different parts of the scientific method in Moroni 10:3-7, 27. We also talked quickly about the experiment of the seed in Alma 32 and how he drew spiritual parallels to how you can experiment with seeds. Experimenting Upon the Word: I told the girls that today we are going to do some other experiments. As we “experiment” be thinking about parallels you can make to the way our testimonies grow. Feel free to shout them out during the experiment, but I will also ask for your thoughts at the end of each experiment. The most important thing I want you to remember is that experimenting requires 1) action and 2) a sincere desire to know. I had some parallels already prepared in case nobody could think of anything, but I encouraged the girls to also come up with more. It was neat to see how many ones we could find and how different they were from each other. Mixing two ingredients together can create a reaction. This particular reaction is sometimes used to clean drains. What are some things we can mix spiritually to get a certain reaction? Example: Broken heart and contrite spirit can bring forgiveness. Two small things can create a large reaction. But some mixtures are harmful. Say if I used bleached instead of the baking soda, I could get a toxic gas and this room would have to be evacuated. What are some toxic mixtures we can have in our own lives? When you drop the Mentos into the soda the dissolving candy breaks the surface tension and makes it easier for new bubbles to form. Mentos work particularly well because they are covered with tiny little pits, the perfect place for bubbles to form. So when the candy goes in, bubbles quickly form all over the candy and soda goes shooting out of the bottle. Example: We are told in the scriptures that there are things we can do to make it easier to feel the spirit; things that make us more spiritually sensitive. For example, how many have felt the difference in their between their ability to feel the spirit when engaged in daily scripture study? In this case, the scriptures are our Mentos! The Borax causes the molecule strands to stick together, changing the mixture from a liquid to a putty-like material that is flexible and easy to mold. Example: In the temple we are sealed together, linking us together. This sealing power changes the nature of our families and makes it easier for the Lord to form us into the kind of family He needs us to be. As the soap gets warmer it gets softer and more pliable. Ivory soap also has air bubbles that become trapped in the soap when it is made. Inside these air bubbles there is also a little water. So when the water heats up, it expands. Between the softening soap and the expanding water, the bar of soap starts to expand. Ivory soap is one of the few soaps that this works with because it has air whipped into it. Example: The Lord can change our natures, making us more pliable and bigger than we were before. Things that we might not be able to do on our own, become possible as the Lord changes us for the better.